Lady CoMo was the victim of a car accident on Thursday. She came out on the losing end of the encounter. It was not my fault. Honest. In fact, I was not even on her at the time. Nor was Mary. It happened in the parking lot of a Toronto hotel where there was only valet parking. Lady CoMo was mounted on top of the car wearing her bras, bat-like. Mary had warned the car jockeys about clearance, etc., etc. It was later than evening, when we got home to Ottawa and I was taking her off the car that I saw the damage. 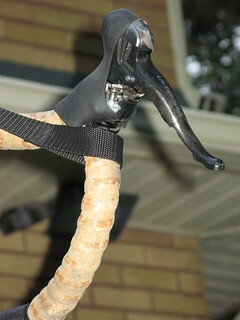 The front brake lever was irreparably smashed. The good folks at Bertrand were open that night and had her all fixed up within 24 hours. They said it's amazing how many car top accidents they get. We also had them change our big chain ring. Our gearing is now 26-40-53 on the front and 11-36 on the back. Those ratios give us the range to almost climb a ladder, or to push ourselves all the way down a hill. We picked her up on Saturday morning, the sky was blue, and we needed a test ride. Off we went to Gatineau Park for the climb to Champlain Lookout. It was the first day of sunblock, riding with bare arms and legs. The gears were great, and the new brake lever did its job (very important!). We are getting better at climbing. At the bottom of a hill I move us to a comfortable gear and as it gets tougher Mary stands. Then, when she tires, I sometimes stand for a bit and we alternate. Stability can be an issue, depending on how tightly she grips the handlebars and fights me for balance, but we are growing accustomed to it and the climbs are smoothing out. On the descents the bigger ring is a definite improvement. We like to keep the pedals engaged even if we are braking – it gives greater control. At the bottom of a descent we can take advantage sooner of our momentum and keep up the pressure to get us up the next hill. The step differentials on the chain rings do require more careful gearing, especially between the middle and smallest rings. I usually do a double shift (i.e. front and back) to avoid too large a jump when down shifting. I also have to mentally keep track of which cog I'm on since there is no flight deck for visualization. So far so good. I don't know if we'll have the legs to do justice to the ride to Kingston this year, but we'll have fun trying! Posted by Kern on May 13th, 2012. Glad to hear it was only a brake lever, you had me worried there. To have a beautiful bike damaged while on a car is just the pits. Can you make any sort of claim against the valet parking people? I'd have been furious! Good to hear that Bertrand were able to sort her out so quickly. They said it's amazing how many car top accidents they get. A guy I know drove into his garage with his bike still on the roof rack. Ouch! Hmmm... now we know (roughly) what's inside an STI shifter and why they cost more than a decent watch. I wonder what happened though. You'd think it would have been knocked clean off but it's still on the bars as if the car was reversed after the collision. Accidents happen but it would be disappointing if whoever did this was aware of it but just kept quiet. Naughty. Anyway all is well and could have been worse. Worried me too, it could have been a whole lot worse, the more I read, the more I assumed you two were on her, or had loaned her to someone. But thankfully, a deep graze. We were actually not in our lowest gear when standing. In fact, on the descent we were often in our largest chainring. By standing, we were able to maintain our momentum to get to the top of the next rise before swooping down again. LOL ... I have to confess, Mary, that I sympathise with Shedman on this front. It's surprising how unstable the bike becomes when you are fighting him from behind. But I sympathise with you too – my Mary constantly reminds me of how much trust she puts in me. I think that's part of some guilt-based psychology so I behave myself 🙂 . Can you make any sort of claim against the valet parking people? Yes, they will cover all costs. It was very interesting to deal with them. Mary made the phone call (she's nicer than I would have been). I read somewhere of a hotel chain that deals with customer complaints using a LEARN principle (Listen, Empathize, Apologize, React, Notify). The hotel folks conducted themselves admirably and gave us no hassles regarding the claim for expenses. They were so pleasant about it we never had time to be furious (i.e. we had not progressed past the initial states of shock and despondency). So all is well that ends well, although we will never park there again with the bike mounted on top of the car. Kern wrote: Mary made the phone call (she's nicer than I would have been) ... The hotel folks conducted themselves admirably. LOL – good news. Obviously a decent establishment. Understood re standing on the pedals.